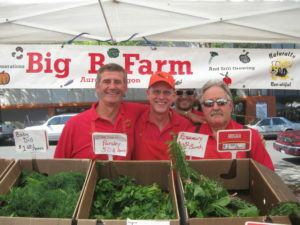 The first few weeks of the season when Big B Farm wasn’t at the Hollywood Farmers’ Market, people noticed. To say the least, this farm has a loyal, vocal following. And for good reason. Maybe it’s the wide array of tempting produce — lettuces, onions, carrots, beets, cucumbers, summer squashes, herbs (we could go on). Maybe it’s the personality of the people. Most likely it’s both. The heart of Big B Farm is Frank Battilega, with a smile and a quip ever at the ready. A third-generation farmer, farming is in his blood. His grandparents immigrated to Portland from Varese Ligure, Italy, a mountain town inland from Genoa, in the early 1900s. So did the Calcagnos, grandparents of Frank’s late wife, Joanne, who died just last year. Both the Battilega and Calcagno families have farmed in the area ever since their turn-of-the-century arrival. And it truly is a family affair, at the market as well as on the farm. Workers at the Big B booth are almost all relatives: Frank’s sons — Matt, Chris, and Joe — and brothers, sisters, nephews, and nieces, with a friend thrown in here and there for good measure. Frank says that he enjoys the ongoing interaction he has with the people who purchase his products, an experience that he believes is important for the younger family members as well. Big B Farm comprises a 40-acre tract in Aurora, Oregon, where the family uses sustainable farming practices and does everything by hand. Hand-weeding and hand harvesting are time-intensive approaches that help yield high-quality products. These are the same approaches the family has used for generations. According to Frank, one of the current challenges facing Big B Farm and other farms is fuel prices. Although everyone is affected to some degree by spiraling fuel and fuel-related costs, the effect on farmers is magnified because of such needs as running machinery and transporting goods to and from the farm. Big B Farm has been part of the Hollywood Farmers’ Market since the market’s inception 12 years ago. Frank says that he appreciates the support from customers, volunteers, and market staff. The support has been present from the very beginning, he maintains, and continues through today.